Does Atlanta Have a Shot at the Outstanding Comedy Emmy? All week long, Vulture is exploring the many ways modern comedy has tapped into its serious side. L-R: Lakeith Stanfield as Darius, Donald Glover as Earnest Marks. Photo: FX Networks. For the entire decade so far, only two shows have won the Emmy for Outstanding Comedy: Modern Family (2010–2014) and Veep (2015–2017). This year, neither of those juggernauts is nominated. Modern Family finally got shut out altogether and Veep didn’t air a new season. That means it’s possible that, for the first time in the Peak TV era, a show like Atlanta — a nontraditional, experimental comedy that’s driven less by situations and more by characters and sometimes serious themes — has a strong shot at taking the big prize. 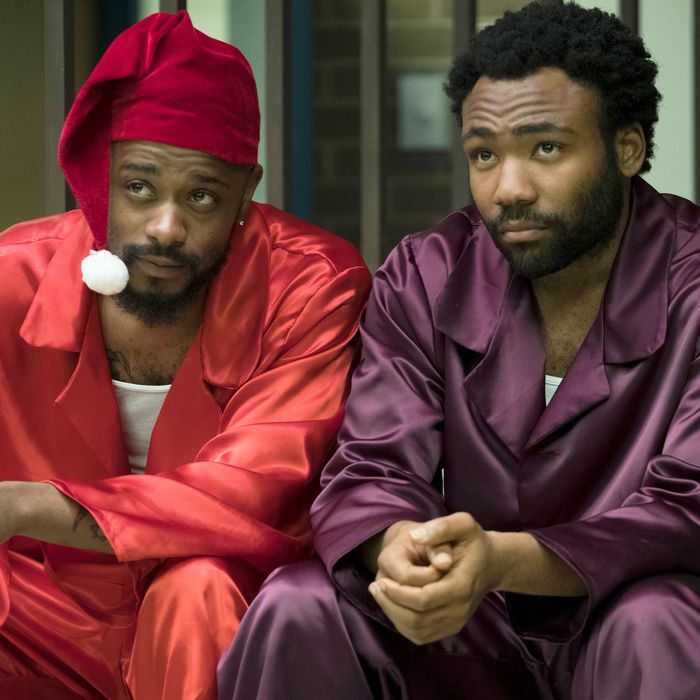 In its first season, Atlanta won two Emmys — one for Donald Glover’s lead performance and another for Glover’s direction of “B.A.N.” But in its second, even more boundary-pushing outing, the Emmy love has come on stronger: It earned 16 nominations, more than any other comedy, which speaks to a high level of support for the series among voters. But even that is not necessarily a guarantee of a win in the overall best series category, for one reason. All of that is true of Atlanta and of a number of other series that have been nominated in the outstanding comedy category over the past decade, including Girls, Louie, Transparent, Orange Is the New Black (before it started competing as a drama), and Master of None. Several of these series have won Emmys for either directing or writing, but never the major awards, and that may go back to O’Neil’s point: Voters are more inclined to honor these indie-movie-style comedies for their craftsmanship, but when it comes to best comedy, the victor needs to be ha-ha funny, full stop. That makes 2018 an especially interesting year because one could argue that nearly every nominee in this category is a Comedy in Theory. Atlanta certainly is. So is Barry and so is GLOW. Unbreakable Kimmy Schmidt is filled with goofy LOLs but it’s about a woman dealing with post-traumatic stress after being kidnapped and abused for 15 years. Silicon Valley and Curb Your Enthusiasm, which rely pretty heavily on shenanigans, are more straight-up comedies than comedies in theory, while both Black-ish and The Marvelous Mrs. Maisel are a combo of the two. Black-ish is a traditional family sitcom in certain ways, but given its emphasis on social justice and racial equality — not to mention a recent season that explored marital difficulties for Dre and Bow — there’s definitely a bit of CIT in its DNA. The dramatic elements in Mrs. Maisel make it more of a CIT, while its stand-up-driven wit and rapid-fire Sherman-Palladino dialogue push it into classic comedy territory. As a hybrid of those two comedy types and a new show that was received very positively, Mrs. Maisel is the other comedy that seems to have the most Emmy buzz behind it and, therefore, seems to be Atlanta’s biggest challenger. If Atlanta manages to prevail, though, it will be a significant moment for a few reasons. It will mark the first time since The Cosby Show that a series created or co-created by an African-American wins the Emmy for outstanding comedy. It will also be the first comedy win ever for FX; if The Americans also snags the Emmy for outstanding drama, a category in which FX has not captured a single statuette, that would be a double whammy of firsts for the prestige cable network. And from the standpoint of how we define TV comedy, an Emmy for Atlanta would serve as trophy-presented confirmation of what most avid viewers have known for a while: that we no longer value comedies primarily for their capacity to make us laugh. That still matters, obviously, and is central to what a good comedy is. But the really good comedies increasingly challenge us by flirting with other genres, presenting complex characters, and dismantling their structures in startling and ambitious ways. (See, among other examples, the “Teddy Perkins” episode.) No other comedy has done that with as much consistency and bravery as Atlanta has. But Emmy voters don’t always go with the daring, most ambitious option — this is why Modern Family kept winning in its third, fourth, and fifth seasons — which may work against Atlanta. But O’Neil, who is predicting a win for Atlanta, says there are some other factors that favor the Donald Glover show. It’s a half-hour series, which overwhelmingly score in this category. (The last hour-long outstanding comedy winner was Ally McBeal in 1999.) It has “a kind of artistic pretension that Mrs. Maisel does not have,” he says. And while a win for Mrs. Maisel would feel timely post-#MeToo since it celebrates a woman trying to succeed in a male-dominated field, Atlanta has an of-the-moment gravitas because of its nuanced look at racial identity. “They want their winners to feel important,” O’Neil says of Emmy voters. And based on multiple metrics, Atlanta feels important, in part because it speaks to the way we think about comedy in 2018, a year when being funny matters, but being fearless matters just as much. How Funny Does Comedy Need to Be?